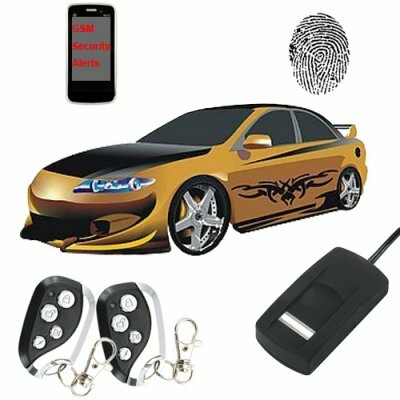 Successfully Added Fingerprint Car Security System with GSM Alerts to your Shopping Cart. The ultimate solution in car theft prevention, one complete system that has a fingerprint ignition lock, dual band GSM (900/1800) messaging system, and standard car alarm style audio alerts. With this one car security system you can have total piece of mind knowing that your car isn’t going anywhere it shouldn’t be. This powerful device uses the latest in fingerprint ID scan technology to make sure only authorized drivers with enrolled fingerprints can start the car. This primary (+ secondary) security system uses a combination of an enrolled Fingerprint plus the car key to enable the vehicle ignition. Meaning that even if someone gets a hold of your keys your car is still safeguarded from theft and misuse! This fingerprint ID security system also allows you to send text commands from your mobile phone to the unit to receive important status messages or temporarily disable certain features. What does this mean to you? Well, for example, if you bring your car to the mechanic and you don’t want him to have access to your fingerprint scanner, just send a simple text message via mobile phone or keychain and the ID scan is temporarily disabled until the mechanic is finished with your car. Or, if your car is somehow hacked into and taken, you can send a message that will slowly cut-off the fuel supply, thereby disabling the vehicle. For status messages, if your daughter says she is driving home you can query the system to see if the car is actually in motion or is still parked at makeout point, a great way to keep your kids on their best behavior! This product is manufactured using only the best parts and the latest technology available on the market today to give you modern biometric security with lifestyle convenience. In particular, the fingerprint ID scanner is designed so it can be installed anyplace in the car (even DIY it into a hidden location of your choice) and works on all brands of cars and trucks. This is a must have product if you want to protect your valuable investment from damage or theft. This product is in stock now and ready for single piece or large bulk purchase. The CVKP-BG04 is proudly brought to you by the leader in high quality wholesale electronics, Chinavasion. NOTES: The GSM functions of this product are compatible with the two frequencies of 900MHz, 1800MHz. Important Note: This product should only be installed by a professional. Carefully review the product manual before installing and using the CVKP-BG04 to achieve the most satisfying user experience. Do I have to scan my finger print every time I want to open the door? No, the fingerprint module is only used to start the cars ignition. You will need either either the car key or keychain remote control to open the door. Does the CVKP-BG04 require any batteries? No, the unit is wired into the cars battery supply using the supplied cables. This unit operates on very little power and also has an internal backup battery just in case your car battery happens to die. Is this unit easy to operate or do I need a degree in technology to use it? After instillation is complete and you use the CVKP-BG04 a few times, you will be surprised at how such an advanced product can be so easy to operate. Just unlock the door, swipe your finger and start your car like normal. When you want to secure your vehicle just turn off the ignition like normal, then get out of the car and press the lock button on the keychain. It really doesn’t get much simpler than this! Can the CVKP-BG04 sense fake fingers? Yes. This unit uses advanced 3D biometrics technology and therefore rejects fakes such as pictures, fake fingers, wax coatings, and photocopies. How can I register my phone number with the unit? You need to have an active SIM card installed into the black main unit for the SMS services to work. To install a SIM card, open the cap at top of the unit by undo the screw from the bottom. After you put a SIM into the unit, just follow instructions on the manual to register your number. to recommend good verarbeitung very good produkt.sehr good.